The sunlit zone of the ocean is where most marine life can be found. As its name suggests, this is the layer of the ocean that is penetrated by sunlight and is consequently the home of most marine plant life. The sunlit zone is also known as the euphotic zone, and reaches about 660 feet beneath the water's surface. Beyond that is the twilight zone, where some sunlight penetrates the water, but not enough for photosynthesis to occur. Kelp forests are one of the most widely seen forms of ocean plant life in cooler, temperate waters. These forests are made up of individual strands of brown algae, with the fronds of the largest varieties reaching lengths of up to 100 feet. With sufficient nutrition and sunlight, they can grow up to 2 feet in one day. Because of the vast size of these forests and their proximity to the surface, there is usually not much other plant life found beneath them. However, the forests are home to a number of different animals, from fish to sea otters. In a wonderful example of the delicate balance of life, the sea otters that made their home in kelp forests fed on sea urchins. When hunters began exterminating the otters for their pelts, the sea urchins overran the kelp forests which, in turn, disappeared from areas in the northern waters. Dinoflagellates are one-celled organisms that are considered plants because of their ability to carry out photosynthesis. These tiny organisms are responsible for the so-called red tide that can be seen during the warmer months, when longer days and warm waters cause a boom in the dinoflagellate population. This is truly too much of a good thing. Too many dinoflagellates in the water can damage the ecosystem, as they release a neurotoxin that can kill many of the plants and animals that coexist with them in the sea. In smaller numbers, dinoflagellates contribute to a thriving ecosystem. 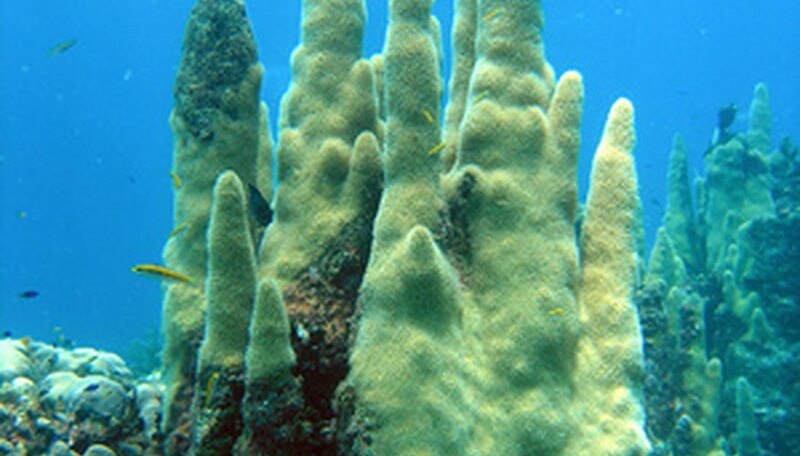 They form symbiotic relationships with some other organisms, such as coral. The dinoflagellates are ingested, then begin producing carbohydrates to help feed the host. This is a particularly important process when it occurs between dinoflagellates and coral; without the access of carbohydrates in their system, coral reefs would grow much more slowly. Some dinoflagellates are bio-luminescent, and when disturbed by something else in the water they may glow brightly. This has given them the nickname "fire plants." 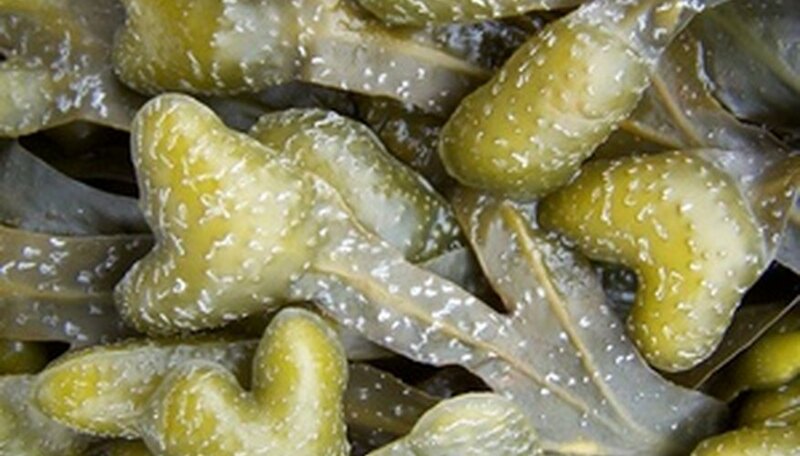 Green algae is one of the most widespread of all marine plants, found in almost every area of the world. Among the oldest organisms on the planet, algae often co-exists with a number of other organisms that are collectively known as plankton. Favorable temperatures and an abundance of nutrients can cause the algae population boom associated with warm climates. 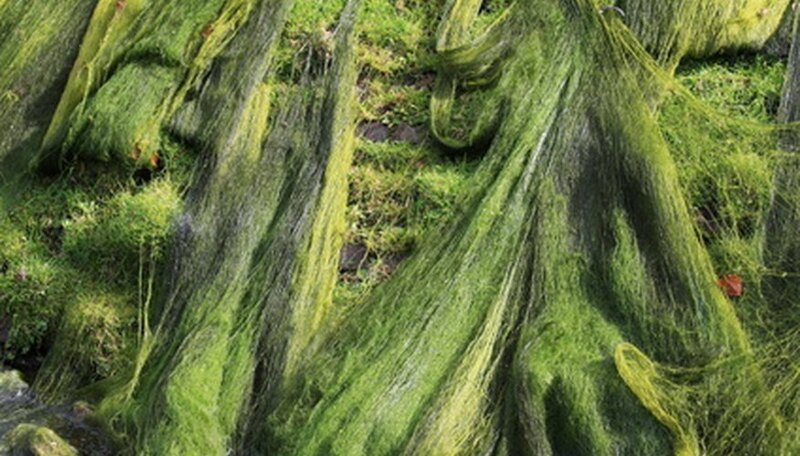 This boom makes the water look as though it's covered with a green carpet, and the covering of algae is particularly thick in waters where there is no movement, such as ponds. Some types of blue-green algae produce toxins that are released into the water when the plant dies. This can poison the water, and becomes particularly dangerous to wildlife and even domestic animals that then drink the water. Do Green Plants Give Off Oxygen? What Kinds of Spiders Live Around a Pond?